A warm tan silky knit dress from Dolce & Gabbana. 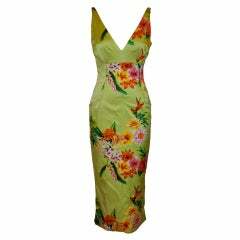 The dress has a V neckline front and back, adjustable length sleeves and an asymmetrical hemline. It has adjustable drawstrings at the neck, sleeves, hem, shoulders and body creating beautiful draping. The effect is beautiful. It is unlined and slips on over the head. One size fits most. 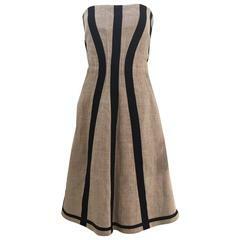 Bust Open Waist Open Hips Open Length as pictured 35-40"
Dolce & Gabanna brown and black stripe linen strapless dress. Bust: 32"/ Waist: 30"/ Lenght: 32"
Dolce &amp; Gabbana Metallic Gold and mint green lace dress. Dress has high collar and french cuffs. Can be worn with collar open as the dress has snaps down the top half of the dress.